The economy is rolling but it might not always. In fact, things won’t always be so great. It’s just the cycle of economics. I’ve been at my job for 12 years. It’s great and I feel secure, as I’m sure do many. Still, it never hurts to prepare in the event of a job loss. Here are some financial considerations in the event of a job loss. These are tailored for my family, but are applicable for many. I would expect that any state unemployment benefits that I would receive would be eaten up by health care premiums, whether it be COBRA or a privately funded insurance policy. We have an emergency fund specifically for events like this. The money isn’t earmarked for anything else. We would use this to pay essential bills. If unemployment were to continue for longer than that time, we would look into one of several options. First, we could sell some investments. We have non-retirement investment holdings that I could sell that would sustain us for another 6 months or longer. Second, we could re-evaluate some of our other cash holdings. We have additional dollars alongside our emergency fund that are earmarked for things like a new car, home repairs, etc. These can be be re-allocated if necessary. Due to having a fully funded emergency fund, I wouldn’t be panicked. Since we could pay the bills without fear of ‘going under’, this would allow me to focus on a job search. As of now, there are lots of contract positions available in my field. I am not inclined to work contract for a considerable length of time. Many are fine with this. I’m not. But, in the interim, to put food on the table, I’d definitely look at these positions. It could end up leading to something permanent. That’s how it worked for my current job! Unlevel some of our spending – I currently put aside an equal amount every month so that our monthly spending is fairly even. But, this has increased the amount of cash that is on hand. We could essentially draw down some overfunded accounts. Of course, we’d work to replenish them later! Reduce or eliminate the A/C and cut back on heat. Cut back grocery spending. We could save some money at the grocery store. First would be working through food we have stocked up. The pantry and freezer would be good for this. When faced with a job loss, finding work is the most important goal. But, making sure you and your family have the basics is just as important. Nobody wants to think of a potential job loss, but preparedness is key. It does happen. It’s happened to me and while I hope it doesn’t happen again, it’s good to know we are ready in many ways. 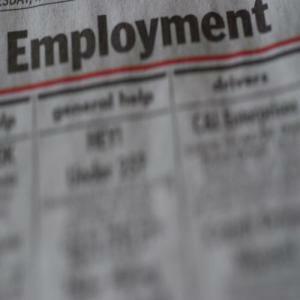 Readers, have you faced a job loss? How did you deal with it? What job loss preparations do you currently have in place? I think it’s important for people to have an emergency plan. That’s similar to this post in that you plan what you’ll do before the event (job loss) happens. This way you do it while you’re calm, rational, and not under a time crunch. Good post. I’ve faced lay-offs numerous times over the years. I don’t worry about it anymore because I am close to “full-retirement” age, hubby even closer. Back in the day though the first thing I always did was register with as many employment agencies as reasonably possible. I was fortunate in that I had a lot of office experience. Back then it was relatively easy to pick up “temp” clerical assignments. Obviously this not the case anymore. That’s where you have to learn to be flexible and ready for today’s world. What makes more sense these days is “side hustles.” Fortunately the internet is filled with resources to tap into today. Good point. Sounds like you learned to be flexible and to roll with the punches. I also think that when you get let go at some point during your career, it teaches you to be more prepared and to not take things for granted moving forward. I was laid off a few years ago, despite being promised over and over again that my contract would be renewed. So I wasn’t prepared AT ALL. We ended up maxing out my line of credit to get by, thinking that it was only going to be a temporary situation. Nope! 2.5 years before I found full-time work again. You can only imagine the amount of debt we took on in that time… Ugh. Now the plan is to avoid ever being in that situation again! Wow, that is definitely a big shock. I can see why you’d want to prepare against that. Hopefully you’ve been able to dig out from under that mountain of debt. Thanks for sharing and for reading! Yesh, I do agree that Reducing Expenses, a good point. I appreciate your research writing. Love it actually. Thanks and carry on.